If you don't own any pharmaceutical stocks right now, you can't be blamed. Patent expiration and price wars always threaten sales and profitability, and consolidation has saddled many with monstrous debt that's hamstringing growth. Nevertheless, a good argument can be made that the risks associated with the pharmaceutical industry have made stocks incredibly cheap -- especially since these companies produce tremendous cash flow that's fueling dividends and buyback programs. 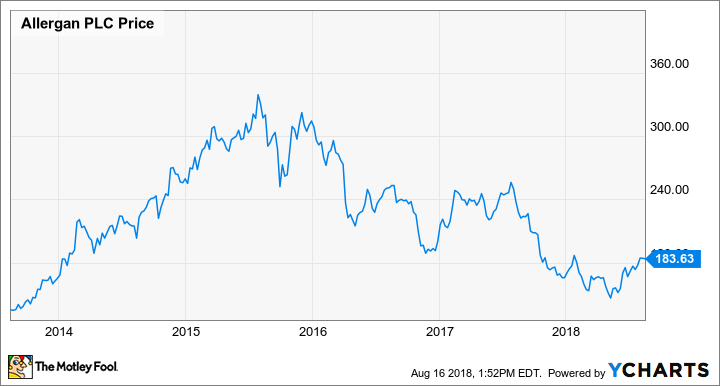 If you're interested in adding a drugmaker to your portfolio for those reasons, the one stock that I'd recommend buying this month is the beat-up Botox maker Allergan (NYSE:AGN). Before buying this stock, it's important to understand why Allergan has found itself in the stock market's bargain bin. Although Allergan's been around awhile, it's only existed in its current form a few years. In 2014, acquisition-hungry Valeant Pharmaceuticals offered to buy Allergan for $46 billion, kick-starting a contentious back-and-forth that resulted in a hostile attempt by Valeant to buy Allergan, which was ultimately acquired in a $70 billion friendly takeover by generic drugmaker Actavis. The tie-up with Actavis was savvy: Soon after being rebuffed by Allergan, Valeant saw its shares crash in the wake of scrutiny over skyrocketing price increases, a suspect relationship with its specialty-drug distributor, and allegations of improper prescription fulfillment and reimbursement practices. The newly formed Allergan arguably dodged a bullet by avoiding a tie-up with Valeant, but it didn't escape unscathed. In order to finance its combination with Actavis, the newly created company had to take on a mountain of debt, and that debt has been a millstone. In early 2015, Actavis issued shares and $21 billion in senior unsecured notes to finance the deal; in June 2015, the newly created company reported total long-term debt of $42.7 billion. Although Allergan forecast free cash flow of $8 billion in 2016 that would allow it to "rapidly de-lever the balance sheet," it didn't quite work out that way. Under pressure following Valeant's fall from grace, Allergan announced in mid-2015 it would sell Actavis' legacy generic-drug business to Teva Pharmaceutical (NYSE:TEVA) for $40.5 billion, including $33.75 billion in cash, a move that would allow it to reduce its debt far faster than it would've been able to otherwise. Following that announcement, rumors began swirling that Pfizer (NYSE:PFE) wanted to acquire Allergan to capture tax savings associated with Allergan's being domiciled in low-tax Ireland, rather than the United States, where taxes were much higher. Allergan confirmed those rumors in October and soon after announced a massive $160 billion deal that valued Allergan's shares at $363.63 each. The deal wasn't meant to be. Tax inversions like the one Pfizer was planning with Allergan drew the ire of regulators in Washington, D.C., and rule changes effectively put the kibosh on the tax advantages associated with them. Once that happened, Pfizer walked away. Although the sale to Teva proceeded, giving Allergan financial flexibility, it had been delayed. The delay, loss of exclusivity on some important drugs (including dementia treatment Namenda), and ongoing concerns about debt levels from investors all contributed to Allergan's shares slipping from their Pfizer deal peak north of $340 to a low earlier this year below $150. The Teva Pharmaceutical deal provided Allergan with a pile of cash that it's used to reduce its debt to $25.3 billion as of the end of June. As a result, the company's quarterly interest payments on debt have fallen dramatically. In Q2, interest expense was $230 million, down from $277 million in the prior-year quarter; through the first six months of 2018, interest expense was $481 million, down from $567 million in the first six months of 2017. Because management continues to reduce its debt, it's forecasting that total interest expense will drop to $900 million this year. For perspective, interest expense was $1.1 billion in 2017 and $1.3 billion in 2016. Reducing its debt provides a nice tailwind to the company's bottom line; however, the potential for profit to improve because of less debt wouldn't matter too much to me if it didn't also appear that Allergan has a good plan to continue growing its top line, despite patent expiration-related headwinds to sales. Loss of exclusivity puts $489 million in quarterly sales at risk between now and 2020, or about 12% of Allergan's $4.1 billion in second-quarter 2018 revenue. Yet, the company's top line still grew nearly 2% year over year last quarter, even after removing tailwinds from currency conversion. Importantly, Allergan believes that promotion of its existing brands will more than offset falling sales of those at-risk drugs. In Q2, total revenue was $4.1 billion. Based on the company's year-to-date performance, management recently boosted its full-year sales forecast to between $15.45 billion and $15.6 billion from its prior guidance for $15.15 billion to $15.35 billion. Management also says it's on track to deliver on its compounded annual revenue growth forecast of 5% between 2017 and 2022. If Allergan can deliver on that goal, it should be able to grow earnings even more quickly. In Q2, the company's cost-consciousness helped reduce its operating expenses by 5.4% from one year ago, and the combination of revenue growth for key products, lower interest expense, and lower operating expenses resulted in adjusted net income growing 5% to $1.5 billion. An increase in cash flow that helped the company complete its prior $2 billion share-buyback plan meant that the extra profit was spread across fewer shares, which in turn led to a 10% increase in earnings per share to $4.42. As long as cash flow continues, I think Allergan is in a pretty good position to continue reducing debt, while also buying back more shares and paying out a modest dividend. The company has a new $2 billion buyback plan it wants to complete within 12 months, it's returned $564 million to investors through the first six months of 2018 via dividends, and its long-term capital deployment plan includes "prudently growing" its dividend over time. Although the company is making headway on its financials, investors have yet to become very optimistic. The company's declining share price has reduced its valuation significantly over the past three years, particularly on a price-to-book basis. As a refresher, price to book is calculated by dividing a company's market capitalization by its total assets minus its total liabilities. The price-to-book metric is a value-investor favorite because it shows how much investors are paying to own a company's stock relative to the company's break-up value. There's no "magic" ratio for finding winners, but value investors often view a price-to-book value below 1 as reflecting a potential bargain. 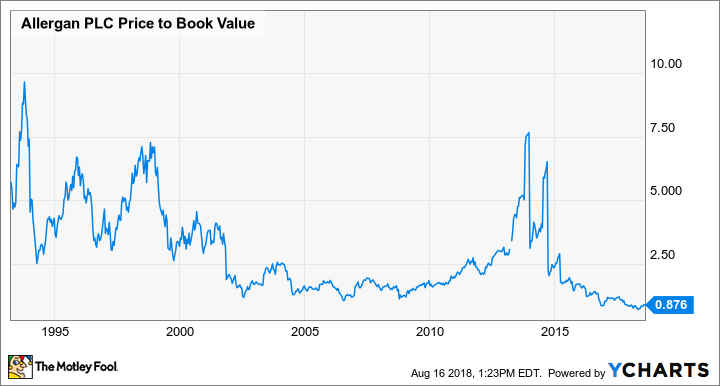 As you can see in this next chart, Allergan's price-to-book ratio is 0.88, and its recent price-to-book ratios are among the lowest on record for the company. Certainly, shares could fall further, making this stock even cheaper on this metric, but historically, buying shares when the price-to-book ratio has been in this area has made sense. AGN Price to Book Value data by YCharts. At 23% of sales, Botox is a significant component of Allergan's top line. Sales of the treatment grew 14% last quarter from one year ago, in part because of increased use in migraine patients. Botox revenue is expected to grow double-digits through 2018, but diversifying revenue across new products could be key to the company's long-haul success. In a bid to do that, the company has a few intriguing drugs advancing toward the regulatory finish line. It's reported positive phase 3 results for the acute-migraine drug ubrogepant, and if regulators cooperate, that drug could hit the market in 2020. It plans to file its major-depression drug, cariprazine, later this year, clearing the way for an FDA decision next year. It also expects to file FDA applications for approval of a glaucoma and an age-related macular degeneration drug next year. There's no guarantee those drugs will reach the market, but each targets a billion-dollar blockbuster indication, so their approvals could move the revenue needle at Allergan. Overall, Allergan seems to be turning a corner, and if I'm right, then buying its shares now, when they're arguably inexpensive, could be a profit-friendly long-term decision.